Mutant obese mice with a voracious appetite appeared at random in a mouse colony at Jackson Laboratory in Bar Harbor, Maine, in 1950. Such animals were found to have a (ob) genetic mutation. During the 1960s, Douglas Coleman found mice with both diabetic (db) and obese (ob) genetic mutations. In 1992, after genetic inbreeding and testing, Coleman, collaborating with Rudolph Leibel, theorized that they had produced obese (ob) mice that were lacking a protein hormone that modulated food intake and body weight and (db) mice that could produce the hormone but lacked the receptor to detect its signal. Working at Rockefeller University in 1994, Leibel and Jeffrey Friedman discovered the gene and the hormone that could suppress food intake and body weight and named the hormone leptin (Greek = “thin”). The obese mice had a genetic mutation that prevented them from producing functional leptin. This hormone is a protein of 167 amino acids that is manufactured primarily in fat cells and acts in a multifaceted manner in the hypothalamus. It blocks neuropeptide Y (NPY), a natural feeding stimulant released by cells in the gut and in the hypothalamus. NPY was earlier found to be a key component in appetite regulation, with small doses stimulating eating, and destruction of NPY nerves causing a loss of appetite. In addition, leptin promoted the synthesis of alpha-melanocyte-stimulating hormone (MSH), a protein hormone produced in the brain that may suppress appetite (but far better established is its role in skin pigmentation). It has been proposed that leptin is involved in the body’s adaption to starvation. Under normal physiological conditions, when body fat is reduced, plasma levels of leptin are reduced, leading to an increase in feeding and a reduction in energy expenditure that continue until normal fat mass is restored. It was hoped that leptin might provide an answer to treating obese individuals in weight reduction programs. Trials in humans revealed that large doses, at frequent intervals, produced only modest weight loss. Because leptin is a protein, it must be injected and cannot be given by mouth or it faces inactivation by stomach enzymes. The search continues. SEE ALSO: Human Digestion (1833), Thrifty Gene Hypothesis (1962), Hypothalamic-Pituitary Axis (1968). 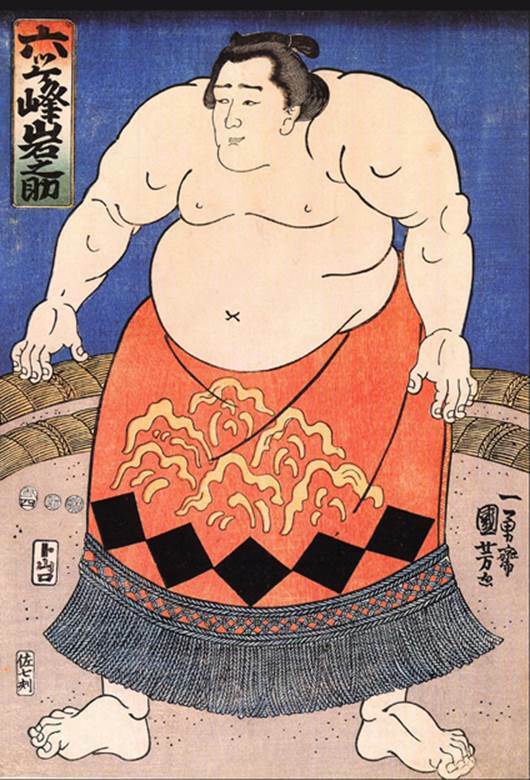 One of a series of sumo wrestlers drawn by Utagawa Kuniyoshi (1797–1861), a master of Japanese woodblock prints and painting. Competitors in sumo wrestling have no maximum weight limits and have been known to weigh in excess of 500 pounds (225 kilograms).